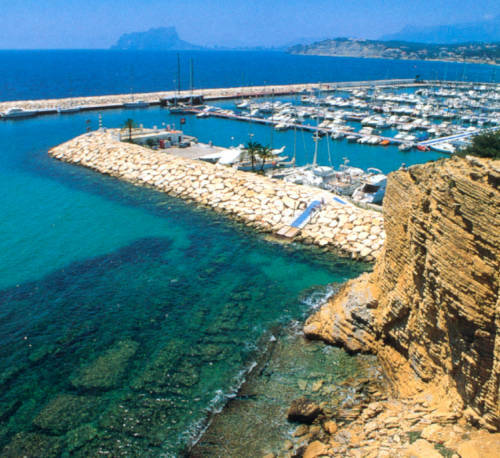 Moraira is the coastal town belonging to the municipality of Teulada but has grown so significantly in the last 20 years to become almost a town in its own right that sometimes its association with Teulada is forgotten. Teulada sits on a hill above Moraira and is populated in the main by local Spanish inhabitants. Moraira is popular with Northern Europeans who find the picturesque setting of white villas amongst the green pines a Mediterranean dream. Moraira village is a small but charming place with an abundance of cafés and bars along the sea front and a good selection of shops and restaurants. Along the coast road towards Benissa are more restaurants and the drive is breathtaking. Despite the influx of Northern Europeans to Moraira, its local traditions, customs and fiestas remain. The beautiful drive along the coast from Moraira takes you to Benissa´s 4 km of small quiet beaches: La Fustera is sandy, Cala Pinets and L' Advocat combine rocks and sand and Cala Baladrar is a shingled beach. Marine excursions and water sports such as diving and fishing can all be enjoyed on these beaches. The town of Benissa is set back from the coast. It retains a traditional Spanish village feel yet it is brimming with shops, restaurants and cafés. The cathedral of Benissa dominates the town and is a mark of the wealth and power Benissa had in the 1920s. The streets are narrow and the medieval centre of Benissa, situated around the ancient prison – today the municipal youth centre – is worth a visit. For modern day living, it has large supermarkets, DIY stores, a weekly market and good access by car or coach to Alicante or Valencia. The most convenient golf course to Benissa is the Ifach Golf Club.